I forgot to say that for each Alsthom set both in O as well as Gauge 1 there will be construction plates available. Who knows, one day...when eyesight becomes worse than now, if that is possible...then larger gauges might become a realistic option. Contrary to common belief that the fat controller never ventures further south than Mount Olympus, he will be taking part in a Train Appreciation Meeting in Kalamata between Tuesday and Saturday next week. Pm if you wish to attend or if you wish to discuss any matter with him. PLease take LOTS of pictures!! BalkanE, I was just joking. There is no train activity in Kalamata. I am here for a short break after working hard to complete the metric MAN which is now at the printers. There is nothing more to do than wait for the first print subject to no design goofies. From the hotel window looking at the beach. A momentous decision has been reached on this momentous day for the UK. 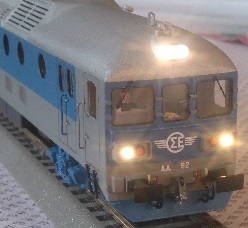 Balkan Models is being put up for sale. It would be sold as an entity, broken up and sold in parts, or consigned to the history books. Interested parties please email with expressions of interest. I will reply to all genuine and serious proposals. PS. I am keeping the shed .